This is the official blog of the Great Books Foundation. We promote the thoughtful, respectful exchange of ideas. We value literature, great literature, literature that has the capacity to inspire and thrill generations of readers. 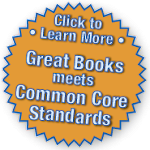 Each year, thousands of teachers make high-quality literature and Shared Inquiry™ discussion a part of the K-12 curriculum. An estimated one million students improve their reading comprehension and critical thinking skills in thousands of Great Books classrooms. In colleges and continuing education classrooms, as well as in book groups, we foster communities of readers who value intellectual growth and civic discourse among friends. The great conversation—talking about the books and ideas that matter—continues well beyond the page, transforming the lives of all who participate. This blog will be a catalyst for thinking about educational policy, for reflecting on the best teaching practices and discovering good reads and grand ideas. Welcome to the Great Books community.